I have never been on any religious pilgrimage in my life. The dust and heat in the air on the Camino de Santiago or the sounds of bells ringing in the distance exist only in my imagination. But I found myself amongst the pilgrims as I attended the opening of the Venice Biennale this year. At the Vaporato (water bus) stops at the Giardinni people are pouring out of the boat that is worryingly full to the brim. There is already a long queue forming towards the entrance. People are all well presented with fashionable sunglasses, Issey Miyake dresses, flowing linen trousers, while also wearing sensible low-heeled shoes for long walks they know they will have to endure. Obviously, these are veterans who have been here many times before. These weathered pilgrims all appear very relaxed and extremely patient, while waiting in a seemingly endless line to gain access to the Giardinni, the Garden of Venice. All is well until I see a girl in tears, as all her friends have proceeded inside, while she is told by the uniformed security guard that she does not have the correct paperwork in order to enter. I am watching this drama unfold just outside the gate. The security guard ushers the teary girl away, as she frantically dials on her mobile. As I cross the threshold of the gate, I observe her brutal sense of exclusion which makes me feel like an imposter. I know that I would not have been allowed in myself, if I had declared that I am just a relatively unknown independent artist. Instead I gained access as a writer/journalist, given a bursary from AN Magazine and with a letter from the chief editor of ArtWay. While it was not a surprise to me that I did not succeed in acquiring an artist ticket, I was stunned to find out that several highly regarded artists also had not been given this exclusive access. These artists are important and notable names who have represented their own National Pavilion in the past. So perhaps this exclusion is a little more democratic after all, not reserved only for underrepresented artists like myself, giving the sense that no artist is supposed to be admitted. Unless they are needed for practical reasons such as to install their works, deliver their talks and workshops, or indeed their names are big enough to endorse the whole affair, I wonder if any artists are really intended to enter this inner sanctum of the art festival. Once inside I encounter a joyous atmosphere. Drinks are flowing, people meeting with their old friends or business acquaintances, with polite kisses and hugs. The leafy shades provided by the beautiful mature trees and the pavilions designed by famous architects create an other-worldly environment. However, when I start to look at the art works, I notice a strange rift between this pleasant environment and the angst present in the works of the artists. Many of the works are very political and engaged with what is going on outside, expressing strong criticism on what is wrong with the world. But within this sanctuary of the Biennale these angry voices are muffled somehow and made palatable for consumption. Although not saccharinely sweet, boxed in this beautiful jewel case of the inner Garden of Venice these serious art works with their very strong opinions seem to lose their edge. The piece called Weeping Angel by Aram Bartholl illustrates this loss of intentionality most vividly. Bartholl’s installation presented at the HyperPavilion features performers dressed as anti-riot police armed with mirror plated shields. 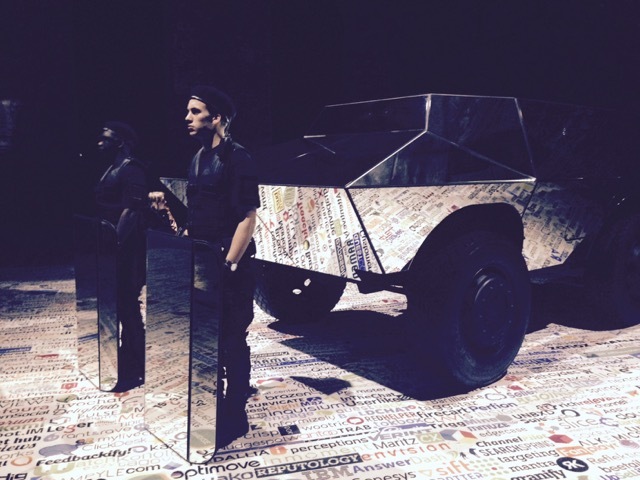 They stand unflinchingly next to a tank which is also clad in mirrors. The floor is covered with synthetic carpet, the sort you may find at the airport with brightly coloured logos printed on it. The intimidating presence of these policemen and the mirrors are supposed to ask questions about “the dark ages of cyber terrorism and our position within it. The title alludes to CIA’s code name for the hacking of Samsung. * Though I cannot fault the way Bartholl powerfully articulates his views, within the context of Venice Biennale no one seems to be threatened by them. Even though the piece reflects the fact that we are trapped within this system without any possibility of escape, the irony is that it is making us feel okay about it. The more we are exposed to visual stimuli of grave issues around the world, the more they become normalized. The strange thing is that although the issues themselves have no possibility of being resolved, by virtue of coming on this pilgrimage the audience feels somewhat absolved from the iniquity unfolding outside of this ‘Garden’. Inside these issues no longer affect us, here we become immune to them. As long as the art works are intellectual enough, deep and thoughtful and challenging enough, even spiritual enough, they are perceived as okay. I begin to understand why people do this bi-annual pilgrimage. It gives us a feeling of re-assurance that we are ‘inside’ the Garden, not outside. It also has an effect of numbing the pain of exiled existence after the Fall, as it gives us an opportunity to find other sojourners, a community of likeminded souls, to find some meaning. A perfect quick fix for deeply rooted human needs. I almost feel like crying, not because this is bad, but because in our reality creativity and pointlessness are so mixed up, and hope and despair are undistinguishable. The beautiful air inside of this garden is full of shadows as well as promises, and yet it is bound by its own enchantment and therefore has no power beyond its walls. It gives us an illusion that we are already home while we are not. I also realize that this is not only a symptom of the art world, but also of church communities around the world. Once we consider our pilgrimage itself a virtue by attending weekly services, mass, prayer meetings and bible studies as a remedy to our exiled status, then exactly the same enchantment is at work within us. Desperate desire to be home can produce an enticing mirage, which is so real that we make the mistake of thinking that we are already home and all the bad things outside are not our problem. While it was outside of the garden where Jesus himself has walked and this is where he is working things through. This enchanted garden in Venice simply confirms how far we have wandered off from the original Garden of Eden and that the way back cannot be found in the artworks or the pilgrimage. So, now it is time for me to leave this garden behind and to face the reality outside. * Quotation from the exhibition press release, Aram Bartholl, Weeping Angels (2017), Hyper Pavilion, curated by Philippe Riss-Schmidt.